Probably the most pretentious restaurant in the city is the Washington. Its location is ideal. Almost opposite the new Schubert theatre and only a few blocks from the Newark terminal of the Fast Line between this city and New York, the Washington is directly across the street from Washington Park. To it business men, with and without their families, go for luncheon, and at dinner time in the evening, and after the theatres have dismissed their quota of pleasure seekers, the dining room presents a gala appearance, while outside of it the streets are lined with automobiles. The service is well nigh perfect. 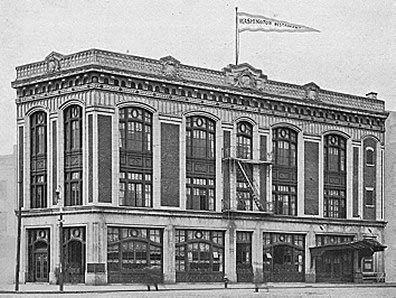 The building is faced with brick laid in Dutch bond with trimmings of Indiana Limestone, marble, and terra cotta. The window treatment and marquise are of bronze. In the basement under the sidewalk is a grill room with the walls and ceiling decorated to represent the different zones. All woodwork is finished in axed chestnut, while the floor is laid in red Welsh tile. The balance of basement provides for a complete kitchen equipment, including an ice machine room for refrigerator, etc. The buffer on the first floor is trimmed in quartered oak with a specially designed ale case, re Welsh tile floor, and paneled wainscot. The restaurant is finished in quartered oak with marble base and columns, paneled ceiling, heavy molded cornice and frieze with silver decoration, side walls of Delph blue tapestry, and Delph blue valances with silver ornamentation. The main vestibule, trimmed in quartered oak, has a mosaic floor and a marble staircase and elevator enclosure. The second floor is trimmed in Spanish mahogany with hall floors of tile and room floors of quartered oak. The third floor decorations are white, French gray and gold, with gold valances. The floor in ball room is of clear white maple. Complete ventilating and vapor heating systems have been established throughout. Entire cost of building was $100,000 or 60 cents per cubic foot figuring from cellar floor to roof.